Meet Polly: sometimes silly, but always so jolly. One day Polly finds a special hat, a magical one at that, and off she goes chanting "Rat-A-Pat-Tat!" With her special hat, it seems as though Polly can do almost anything: hide a ball, a brush, and her mom's big hoop earrings...until one day she loses it. 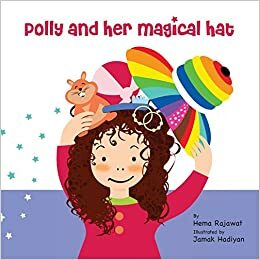 What will Polly do without her magical hat? Read the beautiful rhyming text of this narrative, and feel the energy from the vibrant and playful illustrations, right until the surprise ending that not only warms the heart, but also leaves a bit of magic in the soul.